Amazingly, it’s been 3½ years since I wrote about the arrival of my Insignia, and it’s time for me to be ordering my next vehicle. I’ve got a bit more of an interesting choice to make this time around, with some more luxurious vehicles in the running. The Insignia/Mondeo option is a bit of a last resort if I can’t find one of the first three that I like; I’m nervous about the Insignia because I currently drive a fully loaded “Elite” and know I’ll miss the whistles and bells if I drop down to the “Tech Line”. The Mondeo I didn’t like when I test drove it 3½ years ago, and not sure the smaller engine would do it any favours! So I’ve been out and tried all three of them on for size. Given that I’m looking for the estate version to help carry around a certain daft greyhound, that means the Audi “Avant” model, the BMW “Tourer” model, or the Merc “Estate”. I’ve been able to rule out the Audi already as I simply couldn’t fit in the drivers door. It wasn’t even a question of my being on the large side; I put the seat back as far as it would go and sat my posterior down on the seat, and promptly banged my head as I tried to get in. My knees were around my chin trying, so I gave up pretty quickly! I could fit quite comfortably in both the 3-series and the C220. The 3-series felt rather dated inside, and the fit-out is nowhere near as nice as the C220, so I think I know where this is leading! I’d like to retain the heated seats, and definitely have gotten used to having parking sensors at the front and rear, so I’m hoping I can upgrade the trim to the “Sport” version on the C220, even if that does mean it comes with a Satnav system which I don’t particularly want! So it rather feels as though the decision is made already! Each year, I promise myself to make more regular entries on my blog, and every year I fail miserably. 2014 was no exception, with naught but a single public post in 2014. I once regularly found things to talk about on a regular basis, although admittedly they were fairly trivial, but now it’s less so. I’d like to think that it’s a side effect of the stage of life I find myself in; I’m now the wrong side of 40, and have been in a stable relationship for in excess of 3 years now. I guess many of the things that I might have blogged about have become the province of conversations with my other half. Much of the crap I’ve put up with in relationships before this is now a distant memory, and generally I can see those events in a completely different light now. So, once again I will promise myself that I will try to make more regular comments here; indeed I’d like to think that people may read them, find them of interest and comment from time to time! I’ve not lost my desire for undertaking little “projects”, so that might well provide some fodder for blog entries, time will tell. In the meantime, I’ll just settle for wishing my friends and family a Happy New Year, and wish that for all of us, 2015 will be a better year than 2014 proved to be. I’ve mentioned this previously, but it never ceases to frustrate and annoy me how our Film and Television Studios insist on “rebooting” or re-imagining an existing film franchise. I am of course focussing my thoughts on the Science Fiction and Fantasy genres, since that’s where my tastes lie. Superman, Spiderman, Batman, Judge Dredd, Godzilla, Star Trek, Robocop, Flash Gordon, Total Recall, Conan, Doctor Who, Battlestar Galactica, The Tomorrow People, V, Dune, – all of which have been rebooted or re imagined to varying degrees of success. Usually with a change in some or all of the principal cast, often with Cameo appearances from earlier incarnations, but most of the time with a re-imagining of the original storyline. This frustrates me for two reasons. Firstly, as someone who is feeling distinctly middle aged, I usually grew up with the original incarnation of the film or TV programme, and seeing it re-written and produced afresh with new actors undermines the originals I feel. I don’t mind so much where the storyline picks up later on, or where the original left off, or even before the original (eg Star Wars Eps 1-3). Finding a way to solve a cliffhanger from the last episode or incarnation is where some of the story lines come in to their own, and is not a foreign skill to Scriptwriters, or Storytellers. However even then, the new storytellers have a dangerous tendency to step away from Canon, and play fast and loose with the old history because they think we won’t remember; Take Doctor Who for instance, which in the new post-Ecclestone era seems to have developed a tendency to ignore much of what went before. The Cybermen were originally from Mondas, and in the later series they re-originated from a parallel universe and were supposedly created by John Lumic from CyBus industries. While the two story lines weren’t totally incompatible, there was really no good reason why a new origin and back story was created. My Second frustration is that there is no end of Fiction out there which is crying out for transition to Film or TV, which I wish the Screenwriters and Authors would turn their attention to. Some of the best TV in recent years has come from this route, and includes the acclaimed “Game of Thrones” – adapted from George R. R. Martin’s “A Song of Ice and Fire“. There are of course hundreds more. I understand of course that there is an implicit cost to obtaining rights to materials, and some authors may not be so keen to allow their content to be transitioned, based on the experiences of people like Ursula K. LeGuin with her Earthsea series, where she was exceedingly unhappy with the transition to screen. Of course, not every attempt succeeds, and there are a number of critically acclaimed hits, and an equally extensive list of misses. – Thor, Iron Man, The Avengers, Captain America, etc – The Marvel Machine is doing a great job of making the most of their intellectual property and transitioning one story after the other to the big (and the small!) screen. – John Carter – the attempt to transition the “… of Mars” series by Edgar Rice Burrows didn’t wow audiences, although it was an entertaining enough film in it’s own right. – Oblivion – starring Tom Cruise, but based on a book by Joseph Kosinski, it didn’t really draw the crowds at the box office. – Battlefield Earth – based on a book by renowned Scientologist L. Ron Hubbard, this one had strong potential, but the links including the Star John Travolta to the Church of Scientology contributed to low popularity. – Red Planet – an all star cast including Val Kilmer, Carrie-Anne Moss, and Terence Stamp wasn’t enough to drag this one up the charts. – Lost in Space – the remake starring Heather Graham, William Hurt, and Matt Le Blanc, failed to engage audiences, despite being an entertaining and well executed update. Often these films fail because they don’t stick closely enough to the book to satisfy the die-hard fans. Unfortunately the number of reboots far outweighs the number of original Films & Serials. So this is a heartfelt plea, to the Film & Television industry. Please PLEASE PLEASE, enough with the Reboots and Remakes, how about putting some effort and time in to some original Scifi and Fantasy? My latest weird and whacky project! You may know that I like to dabble a little with Digital Photography. I happened across some information late last year which piqued my interest, and has prompted me to want to give it a try. 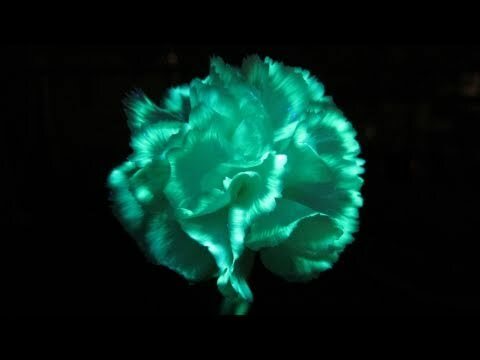 Apparently, if you squeeze some ink from the reservoir inside a conventional fluorescent highlighter pen in to some water, and then use the ink/water mix to feed cut flowers, the flower will draw up the fluorescent ink and it will accumulate within the flower itself, resulting in some interesting effects under an Ultraviolet light. The video on the first linked page explains the process, and makes it look quite interesting! … it looked fascinating to me, so I thought I’d give it a go. I’m currently in the process of accumulating the necessary equipment to give it a go. UV Ink – I’ve elected not to try the dismantling of highlighter pens, but have instead ordered a couple of different coloured UV Inks, I figured that it’d be interesting to see if the different colours have any interesting effects. Blacklight Torch – I purchased two types, a “torch” with a beam, and one of these tube style ones from Amazon. I thought the beam might be a little too obvious or bright, as it’s a point illumination, so decided a more general illumination from the tube might achieve a better effect. I’m currently waiting for the equipment to arrive, then I’ll start experimenting! Results (if they’re any good!) will be posted on Flickr and linked here. 1. Thou shall not attack the person’s character, but the argument. (Ad hominiem). 2. Thou shall not misrepresent or exaggerate a person’s argument in order to make them easier to attack. (Straw man fallacy). 3. Thou shall not use small numbers to represent the whole. (Hasty generalisation). 4. Thou shall not argue thy position by assuming that one of it’s premises is true. (Begging the question). 5. Thou shall not claim that because something occured before, it must be the cause. (Post Hoc / False cause). 6. Thou shall not reduce the argument down to two possibilities (False dichotomy). 7. Thou shall not argue that because of our ignorace, a claim must be true or false. (Ad ignorantum). 8. Thou shall not lay the burden of proof on to him that is questioning the claim. (Burden of proof reversal). 9. Thou shall not assume that “this” follows “that” when it has no logical connection. (Non sequitur). 10. Thou shall not claim that because a premise is popular, therefore it must be true. (Bandwagon fallacy). Please help me spread the word, I truly think this product is brilliant – it’s so simple and effective at what it does, and it’s amazing that it’s not been thought of before! This is something I really must keep an eye out for! I’ve had something in my Amazon wishlist for a while now. When I originally added it, it’s cost was about £90. In the 2-3 months since, it’s price has consistently dropped as we approach the middle of the month, to a low of less than £50, and approaching the end of the month it’s increased again, (currently to a price of ~ £80). None of this appears to be driven by stock quantities, it appears to be consistently “in stock”, and I’ve not seen it running low with “only X remaining” as yet. I rather suspect that this is Amazon being a bit crafty, and reducing prices during the middle of the month, between paydays perhaps! but putting them up again towards the end of the month to coincide with people’s spending habits. If it’s not deliberate, then it’s an almighty coincidence! I guess if it’s still cheaper than originally listed, there IS a saving to be made, but it’s not as good as the saving at the mid point of the month. I’m definitely going to keep watching and check it out again, just to confirm my theory. I’m now about half way through my project to scan a rather old and dusty box of slides dating from the mid 1960’s. Here’s the resulting video montage for some of the family weddings, from September 1968. I really REALLY need to get better at regularly adding some content to this site! Not that it really matters, as there aren’t very many regular visitors anyway, but it’s a habit I need to get in to. It’s been a while since my last rant, and today I have a rant of a slightly different kind to air. I am getting heartily sick of the Media’s persistent and pervasive sensationalism of just about any news story. It doesn’t seem to matter what it is, they seem to latch on to a story, screen an endless succession of talking heads each with their own thoughts and opinions on the news item, they come up with some over-hyped nickname for the event, and promptly seem to forget that there is ANYTHING else going on elsewhere in the world for several days as they tell us the same thing over and over, seeking out any new trifles of information and communicating this to us as the latest scandalous episode in the epic saga. Think of “The Credit Crunch”, the “Triple Dip Recession”, the Pretorius shooting, the list goes on! When are they going to realise that all we need is the news? Sure, the fact that Blockbuster, Comet, Dreams, Jessops, 2e2, etc etc are the latest to go in to Administration is news, but all it needs is a 2-3 minute piece to camera perhaps with a short supporting video clip to tell us about it, we really don’t need the next 15-20 minutes of analysis, and “what does this mean”, particularly when it’s telling us what we already know! I am firmly convinced that the Media is broadly at fault with prolonging the current economic climate. Since every day they tell us how bad things are, remind us of how we don’t have any money, and the economy is faltering, this reinforces any conservative behaviour we may have and we automatically cut back on our spending to economise, which in turn prolongs the downturn, and gives the media another days’ headlines telling us more of the same. Printed media are as much at fault as TV and Radio news, although personally I am finding that Radio news is more useful and interesting these days, as about 5 minutes at the start of each hour is more than adequate to tell me what’s going on, and seems to be far more to the point and relevant, particularly to events that have happened since the last bulletin. I suppose filling our TV screens with hour after hour of news saves the Media companies from having to plan and schedule more new and innovative programme content, (this is another of my frustrations, more on this another day!). I’ve been busy scanning old slides and negatives recently, and below is just one of the fruits of my efforts. A Video montage of some Photos of/taken by my Grandparents on a Majorca holiday in 1968.